Gout is a disorder where uric acid crystals accumulate in and around the joints as a result of high levels of uric acid in the blood and tissue fluids (hyperuricemia). This leads to transient attacks of painful joint inflammation (gouty arthritis). Another similar condition which is caused by raised levels of calcium pyrophosphate is known as pseudogout. These conditions are the two most common crystal-induced joint diseases (arthropathies) caused by endogenous crystals. Similar joint diseases can occur with endogenous (from within the body) and exogenous (external sources) crystals. Gout is more likely to affect men than women, occur in those with a family history of gout, is rare before the age of 30 years and is more frequently seen in spring. However, it is not a seasonal disorder and can affect a person at any time of the year. Uric acid is produced in the body and then excreted through the kidneys. A small amount of this uric acid comes from the breakdown of cells but most is derived from the breakdown of purines which is abundant in proteins. Uric acid can exist in the form of different salts and ions known as urates, one of which is monosodium urate (sodium + uric acid). It is the accumulation of this monosodium urate (MSU) in the joints that lead to gout. However, the term uric acid in general rather monosodium urate (MSU) specifically is often used when discussing gout. Humans lack the enzyme uricase to metabolize uric acid as is the case in other mammals. In order to rid the body of uric acid, it has to be passed out with urine. This is achieved by filtration and secretion into the nephron. However, almost 90% of this uric acid is reabsorbed. Nevertheless the ongoing activity of the kidney ensures that uric acid levels remain within an acceptable range not to cause any disturbance in the body. If there is diminished filtration and decreased excretion and/or overproduction of uric acid, the levels can rise in the body. This causes hyperuricemia – increased uric acid and urates in the blood and tissue fluids. Once the uric acid levels become very high, it may precipitate and form crystals that are jagged. This occurs in the tissue of the joint and within the synovial fluid in the joint space. The reason why this is more likely to occur in the synovial fluid is that this fluid is a poor solvent for uric acid compared to blood plasma. It is therefore more likely to become supersaturated and for crystal precipitation to occur. However, uric acid crystals can occur in these sites yet not lead to joint inflammation and pain. This may be explained by the coating around the uric acid crystals that prevents it from binding to surrounding cells and irritating the tissue. When these crystal are uncoated, it may irritate the tissue and become phagocytosed by macrophages and lead to a series of reactions that facilitate inflammation at the site. Gout is considered as one of the end points of elevated uric acid levels (hyperuricemia). However, hyperuricemia can be asymptomatic and will not necessarily progress to gout. There are two types of gout – primary and secondary. Diet of foods high in purines like fish, meats particularly offals, asparagus, mushrooms. Family history although there is no specific gene identified as yet that may be responsible for gout. Despite these causes and risk factors, gout will not occur in every instance. Secondary gout is where the joint disease arises as a result of some other underlying disease or identifiable causative factor that will lead to hyperuricemia. Enzyme deficiencies or defects that affects uric acid and is at times associated with genetic disorders. Painful inflammation of the joint occurs in attacks which are known as gouty arthritis. It has a predilection for the big toe toe joint (podagra) but may also affect the other joints of the feet, ankle, knees, elbow, wrists and hands. An acute attack of gout presents with severe excruciating pain and the skin over the joint is red and swollen. The area is very tender and even the pressure of a sock or bedding on the joint results in pain. Joint function is temporarily impaired. Other symptoms which may not always be present in every acute attack include fever and malaise. The symptoms reach a peak within a few hours but will resolve spontaneously within one to two weeks. There is persistent discomfort for weeks after the pain subsides. The skin over the affected joint may be itchy and even peel after the attack subsides. The first attack may never be followed by another. However, in most cases another attack will occur within 12 months from the first attack. Recurrent gout may involve more joints than the initial attack. Sometimes inflammation of one joint is followed by inflammation of another joint within days. This is known as cluster attacks. Gradually there is joint damage which may lead to chronic pain. Joint function is permanently impaired although not fully and is usually accompanied by deformity. Tophi are collections of large uric acid crystals. These irregularly shaped nodules are firm and sometimes white in color which makes it distinguishable from rheumatoid nodules. Tophi occur just under the skin near the joints in the hands and feet but may also involve the elbow and Achilles tendon. It arises due to the deposition of uric acid crystals in the synovial lining and cartilage and may even occur distant sites from the affected joint like in the ear. Although tophi are more evident superficially it can occur in deeper lying tissue like the kidney and other organs. 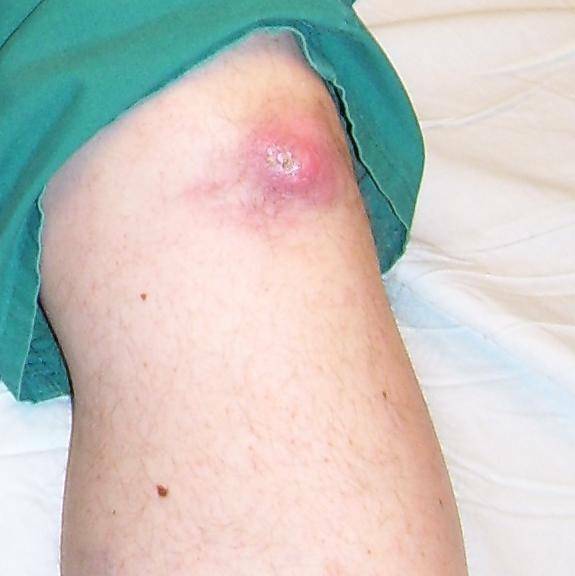 Larger nodules can ulcerate and release a white pus-like discharge although it is not associated with an infection. Hyperuricemia increases the chances of kidney stones (renal calculi). Supersaturation can cause the formation of uric acid stones although not monosodium urate specifically. It also predisposes to the formation of calcium oxalate, calcium phosphate and mixed stones. The presence of renal calculi may present with renal colic (kidney stone pain).